MMA fans believe that the GSP vs Nick Diaz bout is much more feasible than the former's much-anticipated superfight against Anderson Silva. More over, Georges St-Pierre is still the people's favorite. Rumors about a possible Georges St-Pierre vs Nick Diaz welterweight bout has been heating up since then, and many fans believe that it will come true. However, GSP was favored by many to win the contest against Nick Diaz. Betting odds are giving the welterweight champ a -425 line, making his contender the underdog in the rumored fight. And to make the welterweight clash feasible, Nick Diaz was seen talking with Dana White in Las Vegas about the matters regarding the bout. However, the details about their meeting has not been classified. People in and out of the UFC knows that Dana White is considerate to fighters who persist to have the match that they’re asking. If Nick Diaz continues his act, chances are huge for him to have a duel against Georges St-Pierre. 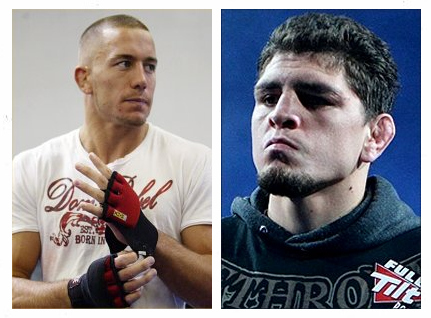 Many says that the Georges St-Pierre vs Nick Diaz match is more possible than the Anderson Silva vs GSP superfight. Nick Diaz’s boxing and jiu-jitsu skills made almost everybody believe that he can match GSP’s capabilities. The MMA fans will definitely be excited to see these two champions go head-to-head once the bout becomes official.